Homework Completion - I Love ABA! This is one of those topics that really transcends Autism or special needs. The majority of my clients who are in school have behavioral difficulties around homework: escape behaviors, noncompliance, aggression, tantrums, etc. But guess what? ?—So do neuro-typical kiddos! It isn’t uncommon that I go into homes and my client needs help completing homework successfully, and so do their older brother and younger sister. So definitely feel free to apply this information to any child you know of who has difficulty with independent and correct completion of age appropriate homework activities (that is the ultimate goal for homework). Homework is such a common behavioral issue for families because it tends to combine multiple non-preferred tasks into one: completing academic tasks that may be very difficult, working on a task for an extended period of time, following multiple step instructions, working on a task independently, and working for delayed reinforcement. Add to that a situation that may be JUST as frustrating and non-preferred for the parent, and homework time tends to be bursting with problem behaviors. So how can ABA therapy help with the bloody battle which is often homework time? ABA therapists approach the task of homework behaviorally. 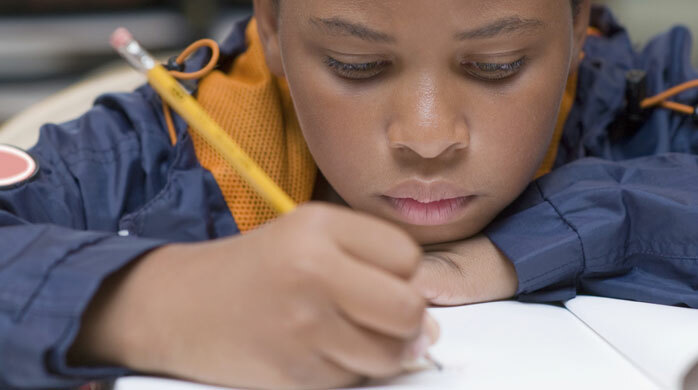 We focus on improving concrete behaviors that will allow the child to be more successful when completing homework, such as listening, attending, reading directions, sitting appropriately in the chair, tuning out noise or stimuli, writing, etc. We will work on homework by targeting the problem behaviors the child is exhibiting to get out of, delay/avoid, or reduce homework expectations. ABA therapists may or may not approach the task of homework academically. That means that the ABA therapist isn’t trying to teach the child how to do long division, their multiplication tables, or who the 17th president of the United States was. ABA therapists are not tutors. If therapy is funded by insurance, depending on plan coverage academic goals may not be covered. Insurance is paying for behavioral interventions, not academic tutoring. What I will usually do is complete the homework with the child for a specified amount of time, and direct the child to give the homework to mom or dad to check while the child and I finish our session. Here are some of the most common mistakes I see parents commit when trying to get a child with an ASD to complete homework. This isn’t about shaming parents; it’s about learning more effective strategies and better ways to tackle the problem of homework completion. Arguing/pleading with the child: Example – “Is that supposed to be a 3? Erase that and do it again that looks like a 8.....Yes it does……Yes it does…….Yes it does” Endless power struggles and arguments with the child are really just intended to distract you from what you are trying to do and delay the completion of homework. Arguing with a child is never necessary because as the adult, you are the final word. If your child is trying to pull you into an argument, don’t respond. Restate the demand and use prompting to help the child respond correctly. Lack of transitions and priming: Example – Parent abruptly walks up to child “Okay, time to do your homework. Come on” Priming basically means you are stating expectations of behavior before the task. This could look like reminding the child to stay on task, that they can ask for help, and what reinforcement they can earn (we’ll talk about reinforcement next). Successful transitions would include telling the child at specific intervals that it is almost time to do homework, such as “it will be homework time in 5 minutes”. Successful transitions could also include making a visual schedule where homework is set for a specific time of day and the child knows that after ____ activity, its time for them to do homework. NO reinforcement: Example – Parent has child working on academic tasks for 40 minutes to an hour with no reinforcement given and no praise. Reinforcement can be tangible, an edible, short breaks, etc. With children who are very noncompliant or struggle with completing homework correctly it might be hard to praise or reinforce the child. If you can’t praise the child’s successful completion of homework, you can praise their effort, or their behaviors, such as “You are sitting so nice!” or “I love how you are trying even though this is hard”. Making endless, empty threats: Example – “We will sit at this table all day until you write your name on the paper!” Making empty, endless threats sends a clear message to your child: I am frustrated, and I don’t mean what I say. I highly doubt you want to actually sit at the dining room table for 5 hours because your child refuses to write their name on their homework. Stick to your original demand and avoid unnecessary language, which is a huge amount of attention to a child who is not doing what you want them to do. Doing way too much homework at once: Example – Parent gives child 2 pages of spelling homework, 3 pages of math problems, and 10 sentences to diagram in one sitting. I don’t really know what happened to homework, but there seems to be a lot more of it since I was a child. Some of my older clients come home with pages and pages of homework to complete. Break the homework down into sections, with easy tasks interspersed with difficult tasks. “Helicopter” mom or dad: Example – Parent hovers over the child as they complete homework, erases the child’s wrong answers, tells the child where to sit, reads the directions for the child, etc. The ultimate goal of homework is that the child will be able to complete it independently. So to work towards that goal it’s important not to use excessive prompting. If your child has the fine motor abilities to use an eraser, then they should erase their own wrong answers. Try sitting across from them instead of next to them. Offer the child choices so they feel more in control. Say to them “Do you want to sit in this chair or that chair?”, “Which pencil do you want to use?”, or “What do you think: spelling or math first?”. Time Out is used during homework time (Nooooooooooo! Please don’t do that): Example – “I told you 3 times to get out your history book! Go to time out until you can listen and pay attention” Time Out as a behavioral intervention will only be effective if the “Time In” environment is reinforcing. If the child is doing homework (which is typically highly non-preferred) then sending them to Time Out is like sending them to Disneyland. What you will likely see is its very hard to get the child to come back to homework after you send them to Time Out, and the problem behaviors keep increasing and getting worse. Instead, set a time limit on homework and choose a very powerful reinforcer. Tell the child if they finish their homework before the timer goes off, they get the reinforcer.